So in my last post I asked if I should make more posts as I go instead of waiting to finish paintings… well oops, I didn’t do that at all. I have a couple paintings I can write posts for since its been so long, but I’m going to start with a quick painting I finished today since its fresh in my memory. Final picture and close ups can be clicked to view closer. To start, this is the finished painting. I wanted to paint something a little more loose than I have been doing lately, with more implied forms and less hard edges. I’ve been feeling really inspired by William Turner paintings lately. So now I’ll go through the process. This is different from all the paintings I’ve posted about on my blog so far, but actually the third painting I’ve used this technique on. The under painting is done in acrylic instead of oil. Because the acrylic dries so fast, this allowed me to work a lot faster than normal. Whereas I would normally do an under painting in oil and then wait a day for it to dry, I could instead finish the under painting and resume working within an hour. Ultramarine blue, turquoise, aqua green, yellow ochre, raw umber, and white. I used the paint fairly thin, as you can tell from all the brush strokes. At this stage my main concern was just to cover the entire canvas with paint, and block in the main shapes. As you can see I am not even concerned with shadows or really any details at all. Because the paint was so thinned down, after I went over the entire canvas, I did not even need to wait for it to dry, so I went back on top and started added some rough details. Mainly I wanted to block in the shadow shapes, and also setting the mood with the sky, which I ultimately ended up changing in the end. Once the acrylic under painting finished drying, I started painting on top with oil. Unfortunately, I only got this terrible photo of this stage of the painting. It was taken in front of an open window and because the paint is so thin, the light shines through the canvas making it a bit hard to see. The paint I used here was very runny. I used Galkyd as my medium for this painting. The paint is very thinned down and even dripped down the canvas as you can tell. I mainly wanted to go over the entire canvas with oil paint and add a little more detail, although it is painted in very roughly. I also wanted to make sure that the under painting still showed through the oil paint. 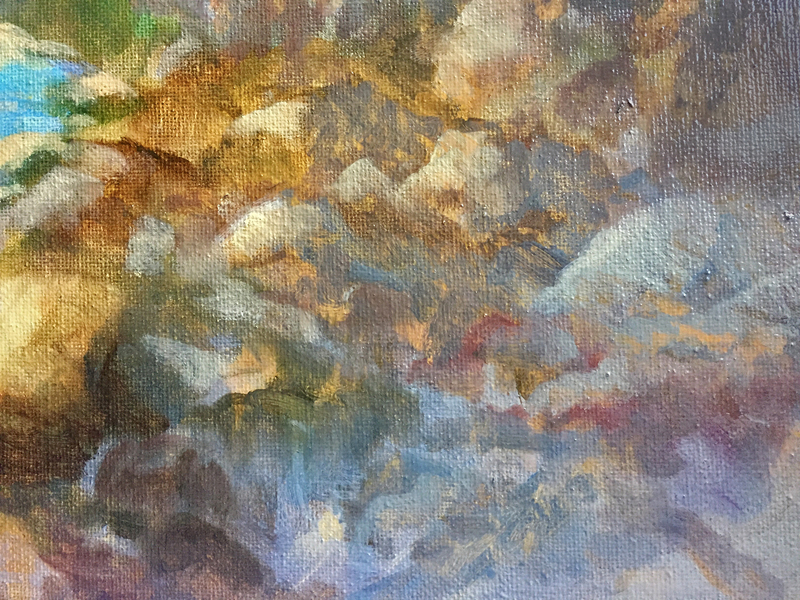 The Indian yellow orange has a weird green undertone to it which I don’t like, because I tend to use orange only as a mixing color to give colors a warmer caste, but I used in in lieu of my preference of cad yellow deep because it is somewhat more transparent. 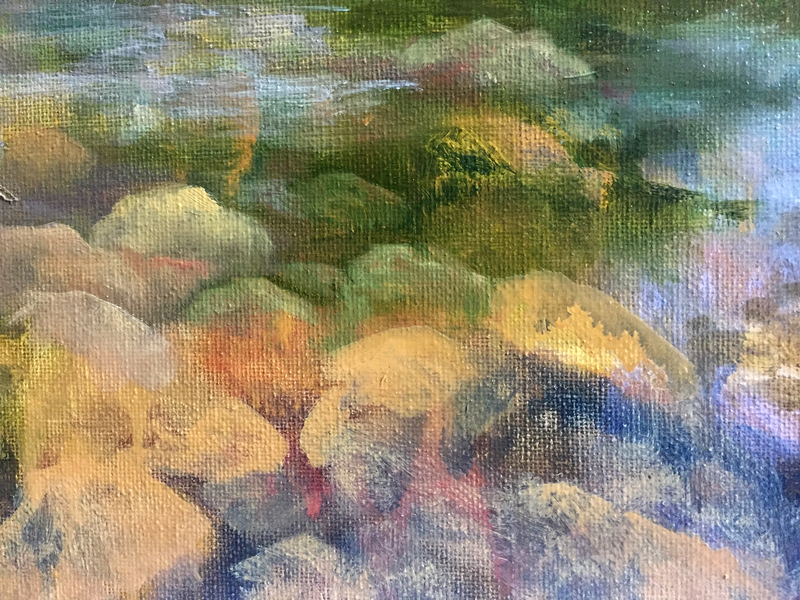 I started with a big brush of thinned paint, starting at the lightest part of the sky, and moving outward from it until I went over the rest of the sky. Next I went over the water, blurring the boundary between the water and sky. 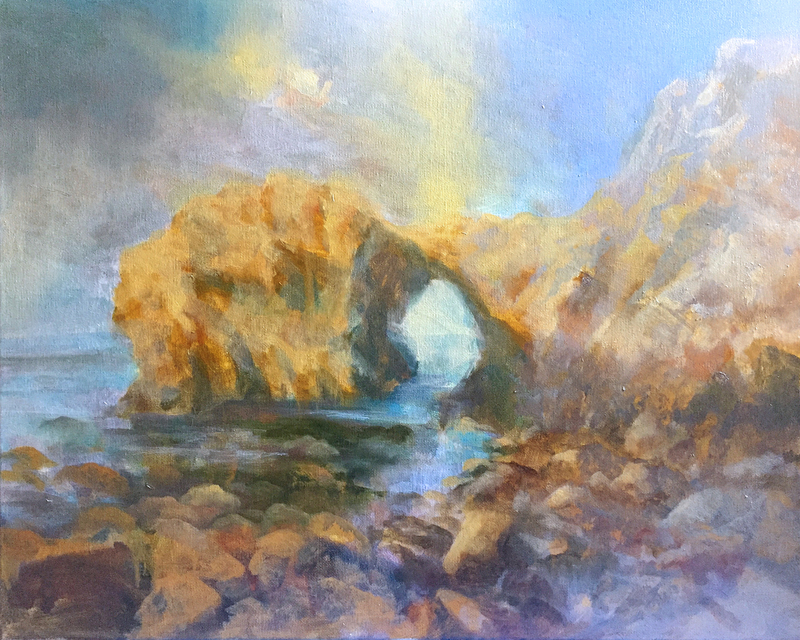 Next I took a smaller brush and started detailing the shapes of the rocks at the bottom of the canvas, mainly by adding in the shadow shapes, and letting the light part of the rock be just the light color that was already on the canvas. I used my fingers to do some soft blending too. The top part of the left side of the cliff. I highlighted the cliff with mostly thinned down Naples yellow. Some zinc white and Indian yellow was also mixed in areas. I let these highlights on the edge of the cliff blend smoothly with the sky. The bright part of the sky is also Naples yellow and white, and shifts into a mix of ultramarine and white. The paint here is thin enough that some of the color from the previous layer, and the sun still show through. The rocks in the lower left. Less detail was added to this section than the lower right. The shadow/reflection part of the water was covered in some green glazes first. The Galkyd dries to a sticky consistency within an hour or two, so once it got to that point I was able to start adding some details like rocks into it. Because my oil brushes are hogs hair, the bristles are tough, and trying to paint on top of very thin paint would actually just scrub the paint off. This is why I waited to start adding detail. I wanted the upper right part of the cliff to be pushed back and feel a little less solid. 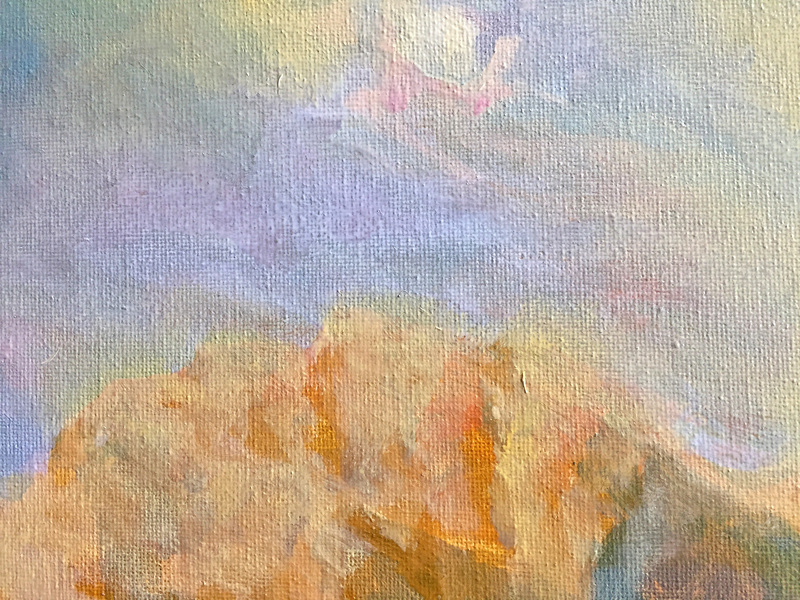 When I painted the sky I scrubbed the same blue, slightly thinner, over this section of the cliff as well. After letting it dry a bit, for the same reasons mentioned above, I started very delicately adding in some highlights with Naples yellow and white. 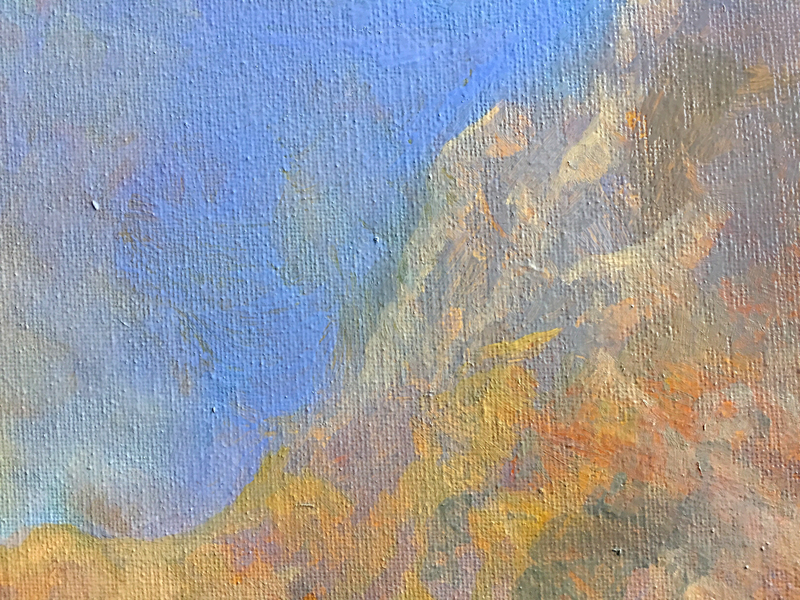 In some cases, I let the bristles of the brush scrub some of the blue off instead of adding highlights on top, which let some of the orange show through. I wanted it to feel very atmospheric so I kept the contrast very low in this area, and most of the cliff in general with the exception of the major shadow shapes. I really like how this area turned out. In the lower right section I began detailing some rock shapes by painting in their shadow shapes. The light side of the rocks for the most part is just the previous layer showing through, though in some cases I added some lighter colors on top using mostly Naples yellow, white, and Indian yellow. The shadow colors were mixed using mostly scarlet and pthalo green, giving a brownish color. I also used a soft grayish blue mixture towards the lower right corner, which has a light white glaze over it. Well anyways, that’s the end of this quick painting. I hope you enjoyed it, and reading about it. I have several other paintings to post about, hopefully I will get to it soon; its hard to find time to paint and write this blog sometimes. I love the churning Tide painting. It looks very real. I can tell that you have some experience with art. That is a good thing to have. The other sea picture may not be finished. I feel detail needs to be in a painting, even if it is subtle.